Severe acute pancreatitis nutrition therapy. Citation: de Baptista GA. Severe acute pancreatitis nutrition therapy. J Gastroenterol Dig Dis. 2017;2(3):47-52. Background: Nutrition Support “crucial to the management of Acute Pancreatitis” (AP). In a significant proportion, this process causes a massive systemic inflammatory response, increasing risk for deterioration of nutritional status, septic morbidity, organ failure (OF), and prolonged hospitalization (LOS). Prevalence increased between 2002-2012 in 16.4%. Overall mortality from 5 to 20% depending on severity. Aetiology First: Biliary (decrease frequency), but there is an increase causes by alcohol consumption and Metabolic Syndrome. Obesity is related with AP severity. AP patients are normally prescribed nil per os (NPO) at admission. Although early introduction of diet has proven to shorten the length of stay, it is still not clear when and how to introduce diet. Early enteral nutrition (EEN) has shown a significative benefit over parenteral nutrition (PN) in terms of infection rates, hyperglycemia and mortality rates. To prevent pancreas auto-digestion, which leads to the release of pro-inflammatory mediators, immune system and gut barrier plays an important role in the pathogenesis of AP. Methodology: This is a literature review. Objectives: Review the diagnosis, pathophysiology of AP combined with timing to introduce Nutritional Support Enteral or Parenteral to try to lower the morbi-mortality and LOS. Results/discussion: Consider the “Timing of Nutrition Intervention”. Bakker Meta-Analysis EN arm of 8 RCTs (Before vs. After 24 hrs. ): mortality/OF/infect necrosis: 19%* vs 45%; OF: 16% vs *42%. Petrov Meta-Analysis of 11 RCTs *p<0.05 Rx started within 48 hrs (EN vs. PN): no significant differences. Petrov in his study Early vs. Delayed EN in severe AP: EIN (enteral ecoimmune nutrition) moderate’s excessive immune responses (SIRS, CRP levels), EIN improves clinical outcome. Total serum Ca decrease in the first 24 hr. is as predictor of severity a risk of necrosis development in AP. Mg supplementation decrease significantly proteases activation and severity in AP and antagonist pathological Ca signaling. Have to be clear the meaning of tolerance and gastric vs jejunal feeding: pain, diarrhea and ileus. w-3 FA may be beneficial for decreasing mortality, infectious complications, and LOS in AP, when used PN delay up to 5 days in initiation of PN may be appropriate to allow for restarting oral or enteral feeding. Use PN should be considered when EN is not feasible after 1 week from onset of pancreatitis episode. Conclusion: Nutritional status must be evaluated. When oral feeding is not tolerated EN feeding through a nasogastric/nasojejunal feeding tube should be attempted within the first 72 h. PN only if enteral route not available, optimal timing remains unclear. Antioxidants w-3 FA, vitamins and minerals (Ca, Mg, Vit C), and the role of immune-nutrients, important to be consider. The preferred route of administration was significantly (P<0.001) related to the practice type: academic physicians (52.1%, 61/117) were more likely to utilize NJ tubes compared to private practitioners (19.9%, 32/161), were most likely to use TPN/PPN than academic physicians (20.5%, 24/117). Predicting the nutritional tolerance remains challenging as current evaluation system needs to be improved. Acute pancreatitis, Nutritional support, Parenteral nutrition, Enteral nutrition, Proinflammatory mediators, Gut barrier. Nutrition Support “crucial to the management of AP”. In a significant proportion, this disease process causes a massive systemic inflammatory response, increasing risk for deterioration of nutritional status, septic morbidity, organ failure (OF), and prolonged hospitalization (LOS) . Despite malnutrition high prevalence, physician’s awareness of malnutrition is weak; nutritional therapy is not used routinely, and governmental policies for nutritional therapy are scarce. Latin America is a region with extreme contrasts where most of the population lives in poverty. Accessing hospitals and health plans is limited, and malnutrition bears larger hospital length of stay (LOS). This assertion does not only extend to Latin America but also to other continents where in spite of great efforts malnutrition and obesity still affects hospitals. AP is a common and potentially severe disease where nutritional support does affect its development in a way it may be considered a treatment in severe cases. In AP prevalence increased between 2002-2012 (16.4%) . The Incidence 13-45 cases/100,000 populations, global estimate 33.74 cases/100,000 populations. 5% patients with Lithiasis AP and 10% can develop Chronic Pancreatitis (CP). The overall mortality ranges from 5 to 20% depending on severity . Aetiology: First: Biliary (decrease frequency), but there is an increase causes by alcohol consumption and Metabolic Syndrome. Obesity is related with AP severity . Patient hospitalization cost approximate 2.6 billion/annual. In his research said AP increased in Shanghai and had a seasonal variation, with a higher frequency of events in the spring and autumn. Chinese festivals are associated with a high prevalence of AP. May be associated with alcohol consumption . In pancreatitis patients are prescribed nil per os (NPO) at admission and advance diet in a progressive manner the following days. Although early introduction of diet has proven to shorten the length of stay, it is still not clear when and how to introduce diet. EEN has shown a significative benefit over PN in terms of infection rates, hyperglycemia and mortality rates. Severe disease is a hypercatabolic situation which often appears in already malnourished patients. This benefit may be related to a decrease in bacterial intestinal translocation. Nasojejunal tube feeding is the preferred site, but there are trials supporting nasogastric tubes, a more feasible election. The digestive enzymes are store as an inactive precursor in zymogens granules inside of acinar cells, to prevent pancreas auto-digestion. The first event premature activation of the intraacinar digestive zymogens is one of the first characteristics of AP. The resulting autodigestion of the pancreas leads to the release of proinflammatory mediators such as tumor necrosis factor α, interleukin (IL)-1β, IL-6, which intermingle with the microcirculation, causing increased vascular permeability, edema, hemorrhage and necrosis of the pancreas. Deep acinar cell injury and amplified inflammatory responses result in SIRS and Multiple Organ Dysfunction Syndrome (MODS), ultimately responsible for AP-associated mortality. It is thought that the immune system plays an important role in the pathogenesis of AP disease. The following lines offer an up to date review of nutritional management in AP, trying to answer the most frequent problems arising in the day to day management of this disease . 1. Consider the diagnosis and pathophysiology of AP combined with Nutritional Support Therapy. 2. Show the newest nutritional interventions available for patients with AP. Health’s personnel must work, first challenge: define when begin oral diet, second kind of diet and route, even EN or PN to try to lower the morbimortality and LOS. Literature review of nutritional management in AP. Since 1998 there are more than 30 reviews, between 2004- 2017 a lot of studies are working to dilucidate the correct timing for the introduction and the best route for Nutritional Support: ESPEN (European Society) 2002/2006, ASPEN (American Society) 2002/2016, Meta-Analysis Marik-Zaloga 2004, Meta-analysis Cochrane Library 2006, Meta-analysis Mc Clave 2006, Metaanalysis Petrov 2008, Evidence NEG y NEY (Gastric or Jejunal), ASPEN 2009, ESPEN 2009 (NP), Cochrane 2010, Spain 2011, International 2012, IAP/AAP 2013, Cochrane 2015, Japanese 2015, Italian 2015, Canadian 2016 etc. • Severe AP represents septic syndrome due to failure of gut barrier, EN can modulate immune responses, improve outcome [9,10]. • Faster resolution of disease process duration SIRS. • Absence of local complications. • Transient OF <48 hrs. Persistent OF lasting >48 hrs. 4. OF: Shock (Syst BP<90 mm Hg). • APACHE II ≥ 8, RC ≥ 3, CRP>150. We can see the results in this Meta-analysis. Use of EN Preferred over PN . Risk ratio PN vs. Post pyloric nutrition. Infection and mortality. Infection: 42.6 vs. 16.1% p<0.0001, Mortality 16.4 vs. 6.1% p=0.02 (Figures 1 and 2). Figure 1: Use of EN preferred over PN. Figure 2: Use of EN preferred over PN. .It is important to consider the “TIMING OF NUTRITION INTERVENTION”. Table 1: Timing of nutrition intervention. Rx started within 48 hrs (EN vs. PN):. Local complications, OF, APACHE II>8 . EEN, NJ (Naso Jejunal) feeds w/in 48 hrs vs. Delay DEN day 8 (Table 2). Table 2: Early vs delayed EN in severe AP. EEN moderates excessive immune responses (SIRS, CRP levels). EEN improves clinical outcome. • Roll of the Biochemistry: Decrease Serum Calcium (Ca) it is a risk for necrosis development in AP. The total serum Ca total in the first 24 hr. as a predictor of severity  Mg supplementation decrease significantly proteases activation and severity in AP and antagonist pathological Ca signaling . 1. Tolerance related to phases of stimulation of enzyme secretion. Level of EN infusion, content of EN formula, individual patient variation. 2. Tolerance related to motility and access to Gastro Intestinal tract (GI): Duration of ileus, Duodenal compression, Infusion method and institutional experience and expertise. Gastric vs jejunal feeding: Pain, diarrhea, energy balance. When to advance to oral diet? Do you have to start with clear liquids? Jacobson: Clear liqs. vs. Low fat solid (no differences) . Sathiariai: Clear liqs. vs. soft diet (↓ hosp LOS on soft diet 1 d) . Rajkumar: Clear liqs. vs. soft diet (↓ hosp and post-PO LOS 3 d) . • Pearce Arginine/Glutamine/FO formula (n=31) [24-26] (Tables 3 and 4). Table 3: Lasztity FO (fish oil) formula (n=28)..
Table 4: Hallay arginine/FO formula (n=15). Lei et al. said about the role of w-3 fatty acids in AP, a metaanalysis of randomized controlled trials: The Cochrane Library, PubMed, Embase, Web of Science, and Chinese Biomedical Literature Database were searched Overall, ω-3 FA treatment resulted in a significantly reduced risk of mortality (RR 0.35; 95% CI 0.16 to 0.75, p<0.05), infectious complications (RR 0.54; 95% CI 0.34 to 0.85, p<0.05) and length of hospital stay (MD-6.50; 95% CI-9.54 to- 3.46, p < 0.05), but not length of ICU stay (MD-1.98; 95% CI-6.92 to 2.96, p>0.05). The administration of ω-3 FA may be beneficial for decreasing mortality, infectious complications, and length of hospital stay in AP, especially when used parenterally. Large and rigorously designed RCTs are required to elucidate the efficacy of parenteral or enteral ω-3 FA treatment in AP. Should we use probiotics  (Table 5)? Table 5: RCT EN and Ecoimmunonutrition in Severe AP (n=183). EN semi-elemental Peptisorb per NJ tube. EIN capsules Bacillus subtilus, Enterococcus faecium. 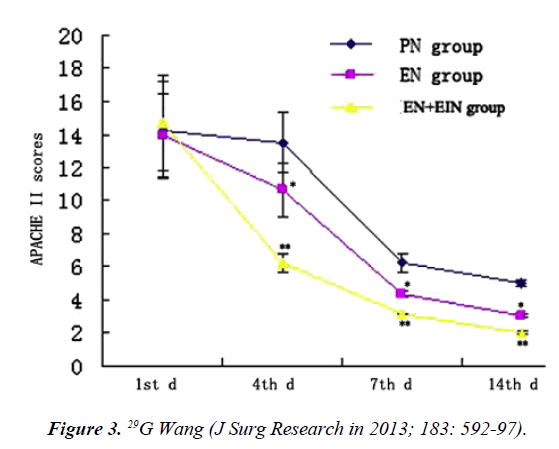 As w e see in Figure 3 when we combined score of severity Apache II with different formulas and days of prescription: EN decrease endotoxin, TNF, IL-6, improves outcome. Adding EIN further benefits (Figure 3). Figure 3: 29G Wang (J Surg Research in 2013; 183: 592-97). • Delay up to 5 days in initiation of PN may be appropriate to allow for restarting oral or enteral feeding . • Use PN should be considered when EN is not feasible after 1 week from onset of pancreatitis episode . Are clinicians becoming aware of benefits of EEN? Sun E. 2013. N Amer Survey (n=406) . No difference gastroenterologists (GI) vs. primary care physicians (Prim Care) (Tables 6 and 7). Table 6: Timing of PN. aThe hybrid private/academic practice class was excluded from the analysis Chi-squared test. Table 7: Preferred route of nutrition by type of practice and specialty. Other includes surgical jejunostomy tube and percutaneous endoscopic jejunostomy tube. In particular, 43.1% (n=175) of respondents used TPN/PPN and 36.5% (n=148) chose NJ tube feeding. The preferred route of administration was significantly (P<0.001) related to the practice type: academic physicians (52.1%, 61/117) were more likely to utilize NJ tubes compared to private practitioners (19.9%, 32/161), were most likely to use TPN/PPN than academic physicians (20.5%, 24/117). When comparing gastroenterologist to primary care physicians, both groups favored PN over NJ tube feeding (P=0.151). In this study in critically ill patients Yao et al. said whether EN is superior to PN with severe AP remains unknown. The objective of this meta-analysis was to assess the effects of EN versus PN on clinical outcomes in a subgroup of pancreatitis patients. Relevant randomized controlled trials (RCTs) were searched in Scopus, PubMed and Web of Science from inception to August 2016. Ultimately, five RCTs including 348 patients were enrolled in this analysis. Compared with PN, EN was associated with a significant reduction in overall mortality risk ratio (RR)=0.36, 95% confidence interval (CI) 0.20-0.65, P=0.001) and the rate of multiple OF (RR=0.39, 95% CI 0.21– 0.73, P=0.003). EN should be recommended as the preferred route of nutrition for critically ill patients with severe AP. Nutritional status must be evaluated. In most patients, an oral soft or solid diet can be beneficial if tolerated. When oral feeding is not tolerated for a few days, EN feeding through a nasogastric or nasojejunal feeding tube should be attempted within the first 72 hrs. of administration. PN should be minimized for its risks of infection and other complications. Only if enteral route is not available or tolerated, PN may be considered. Overall, nutritional support plays a critical role in clinical management of severe AP, although the optimal timing remains unclear. It is important to pay attention to the antioxidants Vitamins, and the role of inmunonutrients. Inmuno Nutrition with currently mixed clinical outcomes is a subject of interest for future evaluation and may lead to promising outcomes. Predicting the nutritional tolerance of patients with AP remains challenging as the current evaluation system needs to be improved. Various nutritional supplements (s) together with PN or EN. In addition, given its heterogeneous aetiological factors and varying clinical manifestations, precision medicine, although not much applied in the condition, remains as a temping approach to optimize clinical outcomes on classified individuals based on susceptibility to the condition and its systemic complications. Mc. Clave S, Greenwood J, Lovelace H. Enteral nutrition in acute pancreatitis: A survey of practices in canadian intensive care units NCP. 2004;19:1-4. Somashekar KG, Kamboj A. The changing epidemiology of acute pancreatitis hospitalizations: A decade of trends and the impact of chronic pancreatitis pancreas. 2017;46(4):482-88. Li-Long P, Li J, Shamoon M, et al. Recent advances on nutrition in treatment of acute pancreatitis. Front Immunol. 2017;8:762. Yoon SB, Lee IS, Choi MH, et al. Impact of fatty liver on acute pancreatitis severity. Gastroenterol Res Pract. 2017. Deging W. Impact of seasons and festivals on the onset of acute pancreatitis in Shanghai, China. Pancreas. 2017;46(4):496-03. García-Alonso FJ, Garrido Gómez E, Botella-Carretero JI, et al. Nutrition in acute pancreatitis. Moreira Vicente Nutr Hosp. 2012;27(2):333-40. Banks PA, Conwell DL, Toskes PP, et al. The management of acute and chronic pancreatitis Gastroenterol Hepatol (NY) 2010;2(5):1-16. Whitcomb DC, Yadav D, Adam S, et al. Multicenter approach to recurrent acute and chronic pancreatitis in the United States: The North American Pancreatitis Study 2 (NAPS2). Pancreat. 2008;8:531. Olah A. Responses, improve outcome. World J Gastroent. 2014;20:16123. Hegazi RA, DeWitt T. Enteral nutrition and immune modulation of acute pancreatitis. World J Gastroenterol. 2014;20:16101-6105. Gillies N, Pendharkar SA, Asrani VM, et al. Interleukin-6 is associated with chronic hyperglycemia and insulin resistance in patients after acute pancreatitis. Pancreatol. 2016; 16(5):748-55. Clave Mc S. Use of enteral nutrition preferred over parenteral nutrition. JPEN guidelines. 2015. Bakker OJ, Van Brunschot S, Farre A, et al. Enteral nutrition in acute pancreatitis. Pancreat. 2014; 14(5):340-6. Petrov MS, Loveday BP, Pylypchuk RD, et al. Systematic review and meta-analysis of enteral nutrition formulations in AP. Brit J Nutri. 2009;101:787-93. Sun JK. Enteral in acute pancreatitis. World J Gastro. 2013;19:917. Schick V, Lerch M. Effect of magnesium supplementation and depletion on the onset and course of acute experimental pancreatitis. Gut. 2014. Chang YS, Hua-qun Fu, Yuan-mei Xiao. Nasogastric or nasojejunal feeding in predicted severe acute pancreatitis: A meta-analysis. Critical Care. 2013;17:R118. Jacobson. ASPEN/SCCM Guidelines. JPEN. 2016. Sathiaraj E, Murthy S, Mansard MJ, et al. Clinical trial: Oral feeding with a soft diet compared with clear liquid diet as initial meal in mild acute pancreatitis. Aliment Pharmacol Ther. 2008;28:777-81. Rajkumar N, Karthikeyan VS, Ali SM, et al. Clear liquid diet vs soft diet as the initial meal in patients with mild acute pancreatitis: a randomized interventional trial. NCP. 2013;28(3):365-70. Teich N, Aghdassi A, Fischer J, et al. Optimal timing of oral refeeding in mild acute pancreatitis: Results of an open randomized multicenter trial. Pancreas. 2010;39:1088-092. Lasztity N. Effect of enterally administered n-3 polyunsaturated fatty acids in acute pancreatitis-a prospective randomized clinical trial. Clin Nutrit. 2005:24(2):198-05. Hallay J, Kovacs G, Szatm R, et al. Early jejuna nutrition and changes in the immunological parameters of patient with acute pancreatitis. Hepatogastroent. 2001;48(41):1488-92. Pearce CB, Sadek SA, Walters AM, et al. A double-blind, randomised, controlled trial to study the effects of an enteral feed supplemented with glutamine, arginine, and omega-3 fatty acid in predicted acute severe pancreatitis. J Pancreas. 2006;7(4):361-71. Petrov MS, Atduev VA, Zagainov VE. Advanced enteral therapy. Int J Surg. 2008;6:119-24. Cheng Lei Q, Wang XY, Xia XF, et al. The role of omega-3 fatty acids in acute pancreatitis: A meta-analysis of randomized. Nutrients. 2015;7(4):2261-273. Wang G. Probiotics. J Surg Research. 2013;183:592-97. IAP/APA evidence-based guidelines for the management of acute pancreatitis. Pancreatology. 2013;13(4):e1-15. Sun E, Tharakan M, Kapoor S, et al. Poor Compliance with ACG guidelines for nutrition and antibiotics in the management of acute pancreatitis: A North American survey of gastrointestinal specialists and primary care physicians. J Pancreas. 2013;14:221-27. Yao H, He C, Deng L, et al. Enteral versus parenteral nutrition in critically ill patients with severe pancreatitis: A meta-analysis. Euro J Clinical Nutr. 2017.